Today, MobileKnox got listed in the Ovi Store. The Ovi Store is run by Nokia and it is expected that it will succeed in the same way the Apple App Store has success. The following screenshots are taken from the Ovi Store application running on a Nokia E71. MobileKnox is found in the Ovi Store after searching for MobileKnox. The detailed information about MobileKnox. 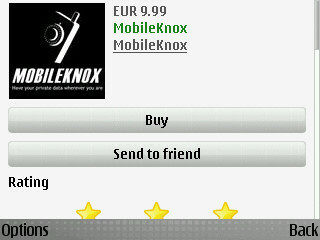 For the first four weeks of the listing of MobileKnox in the Ovi Store, MobileKnox is offered for only 9.95Eur. 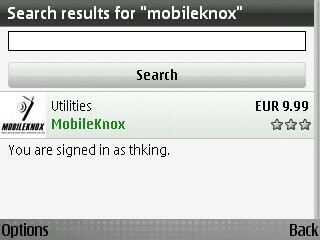 So, go and get your price-reduced full-featured version of MobileKnox. PingPong 1.1.0 fixed a minor hiccup with the representation of the logs. 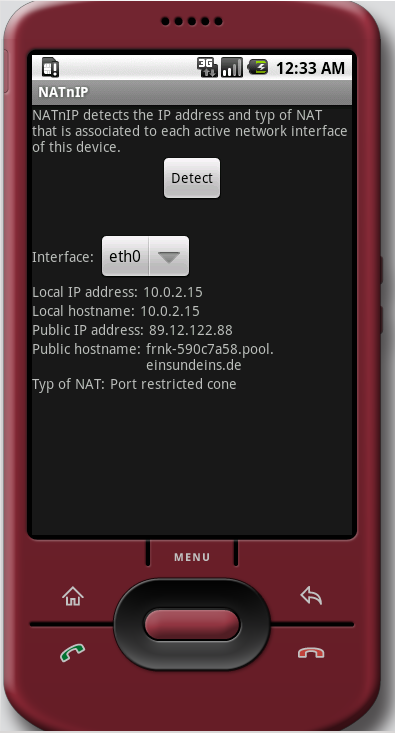 NATnIP 1.2.7 contains a few user interface tweaks to make the look and feel similar to what you have seen from PingPong. Additionally, NATnIP 1.2.7 is localized to German. This means, NATnIP is now available in two languages: German and English. The following screenshot shows the improved user interface in German. PingPong 1.0.1 is ready for prime time. PingPong 1.0.1 comes with an improved user interface. I just finished the development of PingPong 1.0.0. PingPong tests whether a particular host is reachable. For this, it first tries to use ICMP. If this fails, it utilizes a TCP connection on port 7 (echo) to the host. PingPong also measures the round trip time and packet loss. The subsequently shown picture is a screenshot of the application running in the emulator. I am happy to announce the release of MobileKnox and DesktopKnox 2.5. These releases contain a lot of new features and improvements. First of all, MobileKnox and DesktopKnox are now delivered as signed applications which will make the installation process a bit easier. Additionally, this helps to verify that they users are using a tamber-free version of MobileKnox and DesktopKnox. The speed of MobileKnox is improved which will run up to 100 per cent faster than previous versions. Additionally, the user interface is improved so that during computing times a progress bar is shown. DesktopKnox comes now with an import filter for Keepass databases. Furthermore, DesktopKnox is now portable software, which means it can be installed on an USB stick and by plugging in the USB stick into different computers, DesktopKnox is wherever your USB stick is. Have fun using MobileKnox and DesktopKnox. I improved the user interface a bit. Any comments about feature requests or further improvements? I squashed out a few more bugs and improved the user interface. Have fun using NATnIP 1.2.4. The latest release of NATnIP improves some rare conditions such as no active network interface is available or the STUN server is not reachable. In these cases an error message is shown. I just released NATnIP 1.1.0. This release shows not only the IP addresses that are assigned to a network interface but also the hostnames. The following picture shows the screen after the detection process is finished. Additionally, a bug is fixed that caused a never disappearing "Please wait while detecting ..." message if the screen orientation was changed during the detection process.